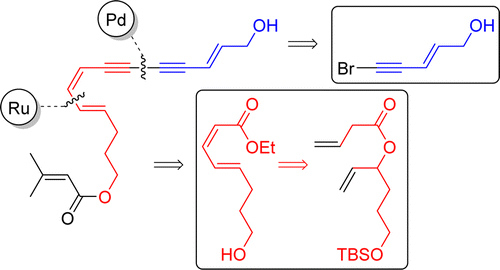 The first total synthesis of the polyacetylene natural product atractylodemayne A is reported. Stereoselective construction of the conjugated (8Z, 10E)-diene moiety was achieved through a tethered ring closing metathesis approach, comprising a Ru-catalyzed RCM, followed by base-induced elimination. A Pd-catalyzed Cadiot-Chodkiewicz coupling was used for the synthesis of the diyne. Overall, atractylodemayne A was synthesized in nine steps for the longest linear sequence.